How Much Does It Cost to Heat Your New Bathroom Tile Floors? With an average high of -1 degrees Celsius (30 degrees Fahrenheit) for the month of January and a record low of -32 degrees Celsius (-25 degrees Fahrenheit) based on worldweatheronline.com, you might picture many Toronto residents huddled under fluffy blankets to stay warm at night. This time of year, the average low is about 8 degrees Celsius (46 degrees Fahrenheit) with an average high of 17 degrees Celsius (63 degrees Fahrenheit), which puts homeowners in that awkward temperature zone of leaving their heat and AC off during the day but needing to turn on the heat at night. 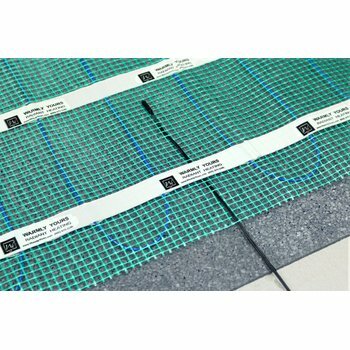 Electric underfloor heating is an excellent addition to your next remodeling project to take the chill off of cold flooring in any room of the home. "Adding In-floor Heating to Any Room from the Bedroom to the Bathroom, is Easy and Affordable"
WarmlyYours has an electric floor heating system for almost any application for any room in your home. Check out some of these room by room examples that illustrate underfloor heating with a variety of flooring types. To get comfortably through the spring and fall months without heating the entire house, installing a radiant floor heating system in the bedroom is a great solution. In this instance, a Toronto resident was able to use electric heated floors as the primary heat source for their 124-square-foot bedroom. Using 432 feet of 120-volt TempZone™ Cable spaced at 3-inch intervals, the system emits 12 watts per square foot. That means the residents can stay comfortable while they sleep, without having to pile on thick blankets. Although Toronto is the largest city in Canada, the cost of installing heated cable under flooring is small. The heating cable itself costs $725, with a nSpire Touch programmable thermostat bringing the price up to $984. To heat this room for 8 hours a day, the operating cost is 92 cents, according to WarmlyYours' Operating Cost Calculator. This tool factors in the average kWh cost in Toronto by postal code, which is about 14 cents. Using TempZone™ Cable is the most cost-effective way to radiantly heat this bedroom. It's also the most flexible option. To install the cable underneath tile, stone or hardwood floors, the cable is affixed to plastic strips placed at either end of the room. These strips keep the heating cable secure as it's being installed and as the self-leveling underlayment is applied. This method takes a little more time and effort than installing heating rolls or mats, but it can adapt to any room size or shape for the lowest price. An alternative to heating with TempZone™ Cable is instead using TempZone™ Flex Rolls. 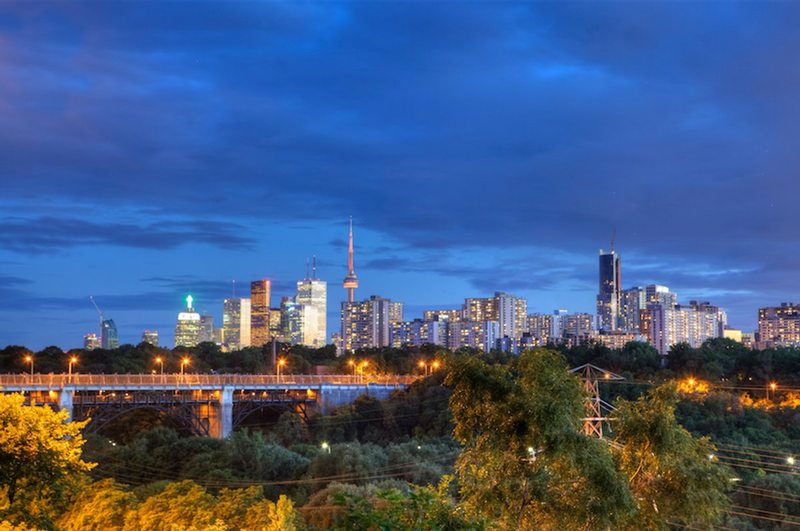 In the case of this Toronto floor plan, a 1.5- by 70-foot TempZone™ Flex Roll offers 93 percent coverage compared with TempZone™ Cable's 96 percent coverage. This Flex Roll is approximately $400 more expensive than the cable at $1,134.00; however, it offers 15 watts per square foot compared with cable's 12 watts. This greater watt density delivers heat faster and more strongly, which can be an added benefit during the wintertime. It’s easy to integrate radiant heating into your bathroom. These Toronto homeowners found that adding radiant electric heat to their guest bathroom was both very affordable and a great way for them to bring floor heating’s welcoming warmth and comfort to their visiting friends and family. To incorporate in-floor heating, they installed a 1.5- by 38-foot TempZone™ Flex Roll in their 64-square-foot bathroom for $718.00 at a cost of just $11.22 per square foot. In addition to the affordable cost of materials, it’s a good idea to calculate the operating cost as well. 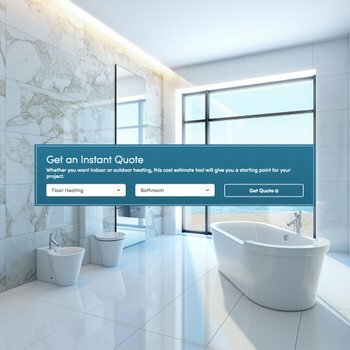 WarmlyYours’ Operating Cost Calculator shows it only costs 24 cents per day to heat this bathroom for four hours a day — a very economical way to add the comfort and luxury of a radiantly warm bathroom with soothing warm floors to upgrade their home. These homeowners had planned to upgrade their kitchen for a long time, so when it came time to fulfill their dream, it made sense to enhance their project with underfloor heating. The cost was $958 for a 1.5’ x 56’ TempZone™ Flex Roll to heat 84 square feet of the beautiful stone floors in this medium-size kitchen. That amounts to just $11.40 per square foot. In addition, the cost to operate the system is relatively low. It costs 62 cents a day to heat the kitchen for 8 hours, based on WarmlyYours' Operating Cost Calculator. This tool factors in the average kWh cost by postal code. A small price to pay for the cozy comfort it brings to one of the most active rooms in the home. These Toronto homeowners decided to install in-floor heating when remodeling their 13‘ x 19’ living room that included a new lustrous marble flooring. They wanted to warm the room where their family gathered together at the holidays and for the many other special occasions throughout the year. They were able to heat the floors of their living room with 864 feet of 240-volt TempZone™ Cable for $1190.00. That equates to $5.50 per square foot. When evaluating a floor heating system, you should also factor in the operating cost. The cost to operate this system is very low. It costs 26 to heat the living room for 8 hours a day, according to WarmlyYours' Operating Cost Calculator. This tool factors in the average kWh cost in Toronto, which is just slightly over 14 cents. When these homeowners recently decided to turn a rarely used bedroom into a useful home office, one concern was that the room faced the northeast and was always colder than the rest of the house. As they were remodeling, it simply made sense to add electric floor heating so that the room would be a consistently comfortable temperature to work in. They chose a 1.5- by 45-foot Environ™ Flex Roll to install in the 112-ft² space for $730.00 at a cost of just under $11.00 per square foot. It’s also a good idea to evaluate the cost to operate the system. According to WarmlyYours’s Operating Cost Calculator it only costs 26 cents to heat this office for eight hours a day. This system can be a primary heat source for the room without incurring additional heating bills which is an added benefit. Once you’ve selected a floor heating system and decided how you’ll be using it, the next step is to find out how much it will cost to operate. The Operating Cost Calculator is an easy to use online tool that will ask the basic questions; product type, room size, local energy rate and daily usage in order to calculate the daily, monthly and annual operating cost of your system. It’s as simple as that. Many people may not be aware that floor heating systems can be an effective primary heat source. Keep in mind that the effectiveness of any heating system can vary given such variables as climate, insulation and the position of the room that you want to heat in your home. It’s important to figure out the exact heat loss of a room prior to installing underfloor heating to guarantee that the heating system can provide enough heat to make the room comfortable. If too much heat escapes from your home or the room in question, floor-heating would be a better supplementary heating option instead of a primary heating source. A few things play roles in exactly how much heat your room loses. First, if your room includes any exterior doors and/or windows, it is susceptible to heat loss. Another significant cause of heat loss is a fireplace. Air often escapes out of the chimney, even if the damper is closed. In fact, approximately 14 percent of your home’s heat loss comes from fireplaces. A Washington Post article reports that air leaks coming from gaps around doors and windows are responsible for as much as 21 percent of your home’s heat loss. How much heat is able to escape determines to what extent your room can be sealed. To help you get the heat loss report for any room in your home, WarmlyYours’s Heat Loss Calculator will ask how well your room is sealed, how many fireplaces it has, etc. to see how much heat is being lost. For example, take a 150-square-foot room located in the Midwest US with an average sealing factor. The room is located above a heated room and the ceilings in the room are 9 feet. Based on WarmlyYours’s Heat Loss Calculator, a floor-heating system can be the primary heat source for this room with the cost about $75.00 to operate the system during the coldest month of the year. To see if radiant heat can be your room’s primary heat source, check out WarmlyYours’s Heat Loss Calculator for yourself. Customize your comfort with the nSpiration series of thermostats from WarmlyYours. Each control has been tailored to meet a specific need. From programmable models that allow you to easily monitor and manage your home comfort remotely from any device to controls where you can set it and forget it, all of our controls are designed to help you get the most out of your floor heating system. For large applications, or additional areas, you may have to combine the nJoin power module with your nSpiration Series thermostat. Control your floor heating system with your smartphone or on the web with the nSpire Touch WiFi thermostat. The added ability to be controlled remotely can accommodate busy schedules. It also offers substantial energy savings without sacrificing comfort or convenience. It’s easy to set up a radiant heating system according to your preferences and schedule with the integrated Install Wizard included with the nSpire Touch. With 4 programmable events for each day of the week, the nSpire Touch allows you maximum control over the floor temperature. You can easily set this control up for your exact needs and specifications with the nHance intuitive user-interface. For consistent schedules, it will deliver a maximum level of comfort when you need it most, like during your morning routine, while still keeping your overall energy use to a minimum. Ease and reliability are benefits of the nTrust thermostat. Because there is no programming required for the nTrust dual voltage (120V/240V) control, you can just set it for your desired temperature and then sit back and relax. Free online tools were designed to simplify your project planning. WarmlyYours created the Radiant Heat Cost Calculator and SmartPlan™ to ensure that you get your project off to a smooth start by providing the exact costs for each room you plan to heat along with an installation plan to accurately see how the underfloor heating would be laid out. We encourage you to upload a floor plan of your room to get a radiant heating SmartPlan™. This gives you more in-depth information than a radiant heat cost calculator because it details exactly how the floor-heating system should be laid out with the electrical plan. 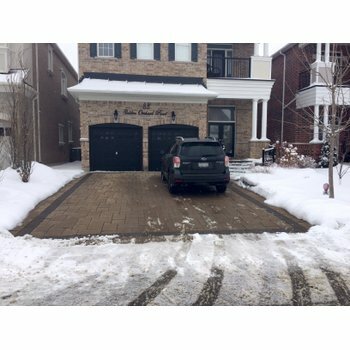 This custom smart plan aids our expert technical staff so they can guide you through the complete installation process making your installation that much easier. When you are ready to install your system, our 24/7 technical support experts will be available to guide you every step of the way, any time you need assistance ensuring your project goes smoothly from start to finish. Using our Radiant Heat Cost Calculator is the easiest way to plan for adding electric floor heating to your project. Just fill in some of the project details and the tool will provide a side-by-side comparison of the suggested products for your room along with the corresponding cost. This allows you to plan and budget for your project. Get started with your own quote right away by clicking here.